Vilfredo Pareto formulated the 80/20 principle in 1906. Quality consultant Joe Juran brought it to management’s attention in the 1940s. Business schools teach it. Most managers pay it lip service or ignore it for the latest ‘bright, shiny, object.’ For our March breakfast meeting, hear authors Tim Nelson and Jim McGee (HBS 1980) discuss their new book Think Inside the Box: Discover the Exceptional Business Inside Your Organization (WCG Press, 2013). They’ll make the case that there’s plenty of mileage left in the 80/20 principle and that there is even more power in expanding 80/20 to two dimensions. Tim Nelson founded Midwest Industrial Packaging in 1987 and sold it to Illinois Tool Works in 2000. From 2000 to 2008, he served as Vice President and General Manager for ITW in several divisions. Tim divides his time between developing and applying the ideas behind Think Inside the Box with multiple businesses and founding and growing Encore Packaging of Lake Bluff. 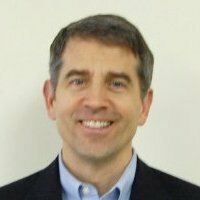 Tim has an undergraduate degree in Finance from San Diego State University and an MBA in Operations and Accounting from the University of Chicago. Jim McGee was a founder of Diamond Management & Technology Consultants (now part of Price Waterhouse Coopers) helping it grow from 25 employees in 1994 to over 1,000 consultants and $260 million in revenue in 2000. 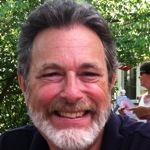 Jim divides his time between writing, teaching, and consulting. Jim has an undergraduate degree in Statistics from Princeton and an MBA and Doctorate from Harvard Business School. 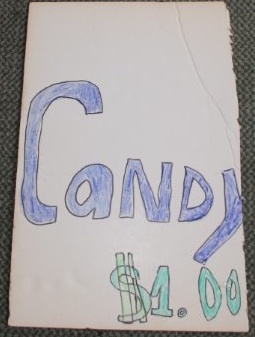 Years back, in an effort to teach my children about money, we set up a candy store in the company. 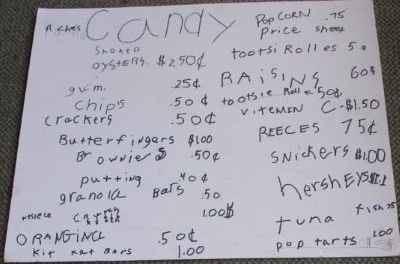 The first sign shown comes from the Candy store we set up with my first son. It offered a wide range of choices, multiple price points, and food choices that required us to shop at several different stores in order to stock them. This second sign comes from the Candy store my second son set-up after the company had been through the ITW complexity reduction process. We had one product offering, one price point, and had narrowed our offering to our core products. The second candy store was easier to manage and run. It also made more money. We didn’t have to worry about change and the product offering could be whatever was available at the grocery store. In the end, the customers at the second store always left with what was being advertised and so they seemed happier. This is probably the simplest, but most compelling, Product Line Simplification (PLS) story I have ever seen. Obviously, General Motors can’t just put a sign outside the dealerships and proclaim “Cars $24,995”, but the proliferation of products and customers is the key driver of complexity in any organization. Complexity is exceptionally camouflaged and difficult to find. Often it is concealed in the minutia. Many people who learn about the 80/20 process and PLS presume that we are mindlessly going to eliminate the 80% of the products that produce 20% of the revenue. This couldn’t be further from the truth. PLS is a methodical process. Correctly done it is extremely powerful. Rushed through haphazardly, it can have major negative repercussions on a business for years to come. 80/20 Quad Analysis offers a clear and systematic way to work through product offerings and customers and be confident that you are making good choices for your company. It is only after the PLS process that I ever see organizations make game changing transformations. They are ALWAYS there waiting to be discovered. But you can’t hear the music until you have eliminated the noise. Candy anyone? Only a $1.00. The collaboration that produced this book began with a conversation at a Christmas party. A mutual friend suggested that we meet to investigate the overlap in our backgrounds and interests. Our lives had already intersected in several ways in the community where we live. In the mid-1990s, I coached Tim’s son in AYSO soccer. Our wives both play in the Handbell Choir at our church. What we hadn’t previously done was compare notes on our professional backgrounds and experiences. Why weren’t more organizations routinely doing 80/20 analysis? Why were organizations reluctant to implement the seemingly simple changes needed to reap clear rewards? Why were the straightforward tools and techniques he had learned not taught, while more esoteric concepts with limited application filled classes, seminars, workshops, and journals? How is the practice of organizational change evolving when change is the norm rather than the exception in today’s competitive, dynamic, and global, economy? Why are organizations slow to adopt new knowledge about using data and information to make more effective decisions? How do you connect insights to sustained, effective, action in complex organizations? Our mix of interests and experience led us to tackle these questions from a pragmatic perspective. The changing economics of data processing and software technology make the tools for this work affordable and accessible to organizations of virtually any scale. And the essence of connecting insight to action depends on effectively engaging those with the power to implement change in the process of developing insights from the evidence. We think the ideas here are pretty straightforward. They aren’t always explained as clearly as they might and they aren’t generally pulled together in one place. The book is our effort to do both. This blog and the web give us a place to close the loop with others interested in the same issues, continue the conversation, and make it even simpler. I started Midwest Industrial Packaging (MIP) in early 1987. It was a classic startup in a market too small to attract a large company but large enough to support a healthy medium sized business. The market for industrial packaging products and materials wasn’t glamorous but MIP provided products that every business needed. Over the next thirteen years, MIP grew to become the world’s largest simple packaging tool company selling over 100 different products to 1,000 customers in 44 countries. We manufactured forty of these tools; the remaining items were purchased overseas and resold. In 2000, we generated $7 million in sales, 4% in operating income, turned inventory 3 ½ times per year, and employed 52 people. The operation was textbook, as taught in most business schools, with machining, assembly, quality control, shipping, and receiving. Products were manufactured in batches to make more efficient use of manufacturing assets and complicated set-ups. The Quality Control department inspected incoming raw materials and parts, inspected the first products off the line during batch production, and checked outgoing products before shipment. Materials handlers pulled parts and material from stock to prepare batches for assembly, monitored and tracked key parts during assembly, and periodically worked to get rapid delivery of key components when a shortage threatened to slow up or stop a production batch. In 2000, Illinois Tool Works (ITW) identified MIP as a potential acquisition target. For one thing, MIP could round out ITW’s product line as a value brand. MIP products could also be offered to customers as a way to generate incremental sales and income from existing accounts that ITW didn’t already have. As a part of the acquisition agreement, MIP continued to operate as an independent business unit. Based on their review and due diligence, ITW believed there were opportunities to significantly streamline and improve our operations. ITW bought MIP and hired me to manage the company during the transition. Our staff and I started to learn, apply, and modify the tools, techniques, and methods that became Think Inside the Box. What were the results at MIP? Over seven years, operating income rose from 4% to 28%. Inventory turns rose from 3½ to 12 times per year. Revenue per employee went from $143,000/year to $435,000/year. The valuation of the business was $20 million more than what ITW paid me in 2000. All of this was accomplished with the original management team, the same resources, and the same customer base. There was no grand change in strategy, no radical innovations in technology, no clever financial engineering. The methods and practices we applied at MIP worked as well as they had elsewhere in ITW. ITW has always been public about their playbook and practices. These practices have always identified opportunities for improvement. I started work on the book to allow any organization to travel this path without the $20 million tuition bill. 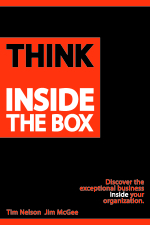 Think Inside the Box is available on Amazon.com in both Kindle and dead tree versions. This site, insidethe8020box.com, is live and this constitutes our official “Hello world” post. Look around. We have the basics for the book—description, authors’ bios, links to order, testimonials, and reviews. We also have supplemental materials that made more sense to deliver in digital form. We’ll use the blog to share stories, comment on events relevant to our work, and anything else that seems to be relevant and useful. It will evolve. Help us make that happen. Comment, criticize, share your experiences. Feel free to say nice things as well.